Some 1,500 light years from Earth, a mystery of stellar proportions is playing out. A singular star out there captured scientists' and the public's imagination in September 2015 with its strangely fluctuating brightness. Ever since then, the scientific community has been observing this enigmatic character and sifting methodically through the data in search of an answer. Certain explanations are eliminated, while other likely suspects come to the fore. Meanwhile, the world has the chance to watch, as the scientific process and the mystery continue to unfold. The star under scrutiny is officially known as KIC 8462852, but was nicknamed "Tabby's Star," for its discoverer, Tabetha Boyajian, an assistant professor of astrophysics at Louisiana State University in Baton Rouge. It first became famous when data from NASA's Kepler space telescope revealed that sudden and significant dips in its brightness had occurred in 2011 and 2013. The star's light dimmed by as much as a whopping 22 percent for days at a time. No other star out of more than 200,000 that Kepler measured during its original, four-year mission behaves in exactly this way. "This [dimming] behavior was not something we were looking for or had trained our algorithms to find," Boyajian said. "In fact, we were first alerted to the star's unique activity by citizen scientists participating in the Planet Hunters program." The internet's favorite theory to explain the strange phenomenon was that this could be a Dyson sphere—a hypothetical structure built by an advanced alien civilization to collect energy from its star. However, new data from NASA's Spitzer space telescope and the Swift mission, along with a Belgian observatory used by amateur astronomers, provide strong evidence against such a "megastructure." These observers were looking at another type of enigmatic behavior from Boyajian's star: a less extreme, long-term dimming that is also difficult to explain. What they found tells us something about the sudden dips in the star's light, too: Their results show that a large, solid object like the hypothesized structure would not cause starlight to dim in the precise way the telescopes observed. The scientific community has actually favored a number of more plausible explanations all along. These scenarios are subjected to the same rigorous assessment: a group of researchers leans toward a particular idea, they make observations of the star, analyze the data, compare their proposed scenario against the findings of other researchers worldwide, and see how it all adds up. So far, these investigations have led scientists to rule out multiple hypotheses for the behavior of Boyajian's star, at least pending any further developments. Yet it's this process of elimination – scientists working their way through the likely culprits, crossing names off their list, one by one – that will bring us closer to solving the mystery. The most recent findings, based on the new data from Spitzer and Swift, point the finger at an uneven dust cloud orbiting the star to explain the long, slow dimming of the star, which may prove related to the short dips in brightness. 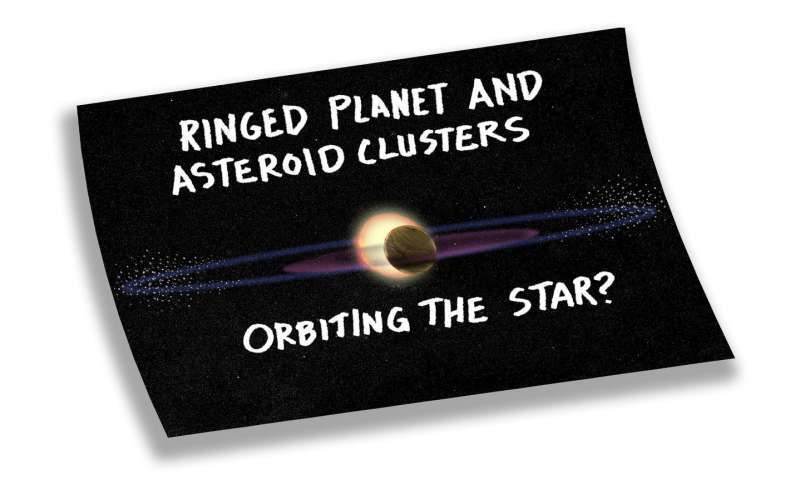 As for the latter, one study has suggested that a star orbited by a ringed planet and clusters of asteroids could exhibit the same strange dimming behavior. 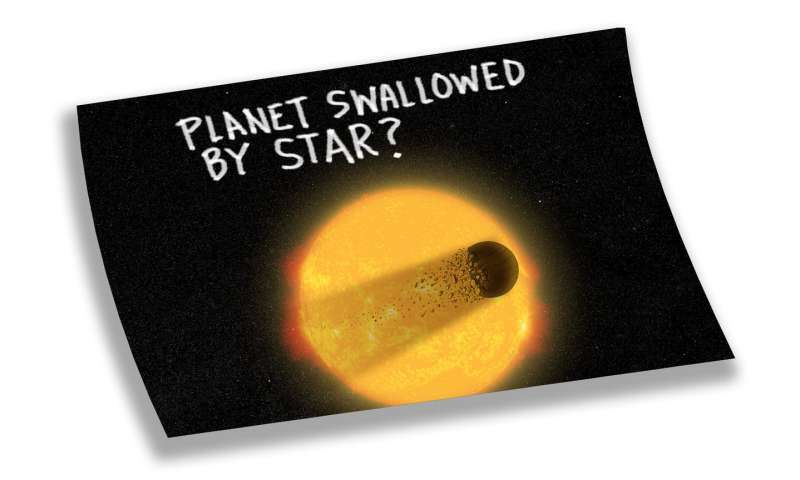 Yet another has considered a planet being pulled apart and swallowed up by the star. These relative newcomers to the mystery have followed other explanations previously put on trial by scientists for the strange behavior of Boyajian's star. Here are a few of the "accused," and the evidence that exonerated them. 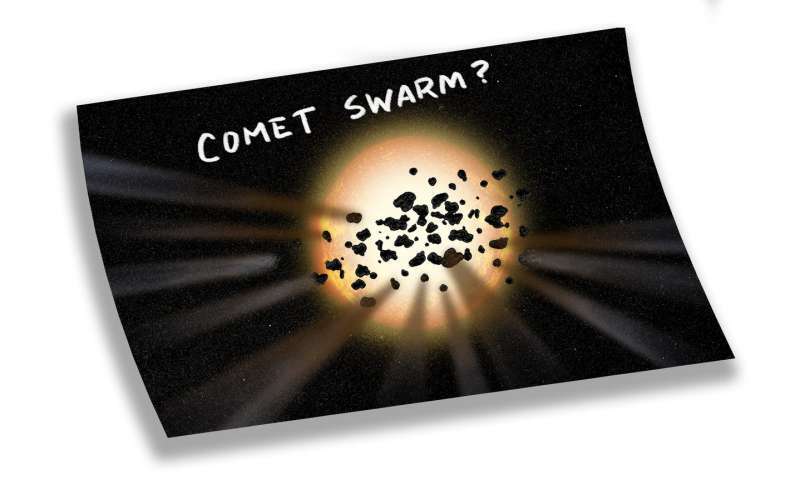 Could it be a swarm of comets? One explanation for Boyajian's star's mysterious short-term dimming behavior could be a swarm of comets – hundreds of them, at least – passing in front of the star. Such a large amount of debris could be capable of blocking enough light to dim the star considerably, and at irregular intervals, but here, too, it has thrown scientists a curve ball. The temperature of all the dust and debris associated with a horde of disintegrating comets should make it glow in the infrared – something the Spitzer telescope would be able to see. Spitzer, however, found no excess infrared radiation. 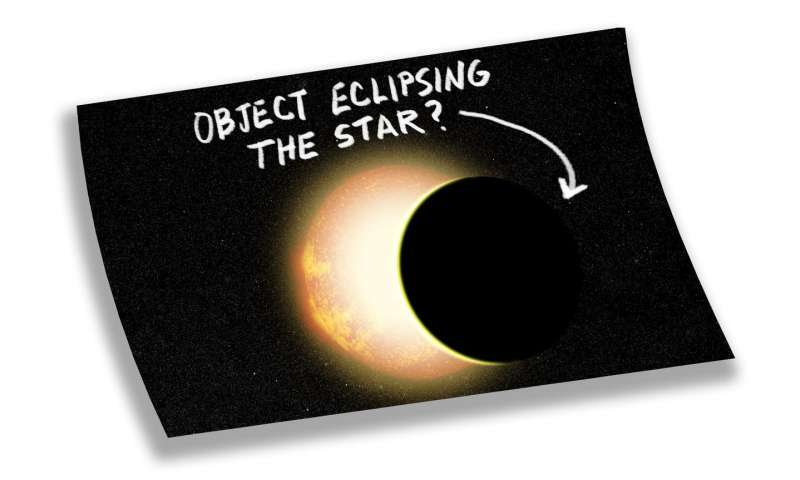 What about an object eclipsing the star? Could it be a large object passing in front of the star? This is the type of dimming that Kepler was designed to detect in its hunt for exoplanets: like a mini-eclipse, a planet crossing the face of its star will cause a tiny, but observable, decrease in the brightness. In this case, though, the extreme dimming events would require a star-sized object, and the gravitational force exerted on Boyajian's star by such a companion would be obvious in follow-up observations. Nothing has been detected so far. "When I first saw the data, I was immediately reminded of the eclipsing triple-star systems discovered by Kepler – systems like KOI-126, which show similar patterns of irregular, eclipse-like dimmings," said Natalie Batalha, an astrophysicist at NASA's Ames Research Center in California's Silicon Valley. But, again, a star engaged in such a complicated relationship would feel the gravitational pull of its partners, bringing a strange rhythm to its dance: a systematic wobble of the center of mass of the system. "I was very surprised to learn that follow-up measurements with ground-based telescopes revealed no evidence of a stellar-mass companion." Is the star just burning out? Despite the subtle, long-term dimming observed, this is not a matter of the lights simply going out at Boyajian's star. Astronomers have determined this is a type of star that is fusing hydrogen into helium in its core. Given that fact and where it is in its expected lifetime, it should be gradually brightening, not growing fainter. Apart from its long-term evolution, a star's magnetic activity – which produces sunspots – does go through shorter cycles, creating some ups and downs in brightness. However, the extent of those changes and the timescale on which they occur are not comparable to this one's sudden, dramatic dips. For example, the brightness of our sun may decrease periodically, but that's a change on the order of just one-tenth of one percent over its 11-year solar cycle. 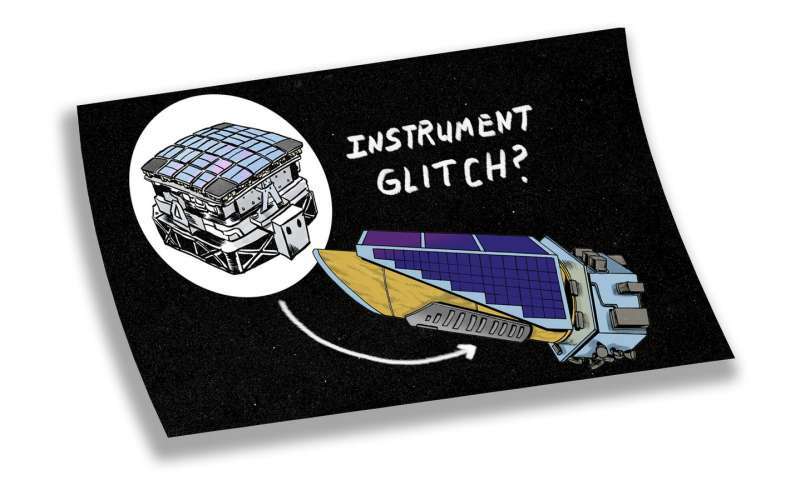 Was there simply an instrument glitch? Some observers questioned if an instrument glitch could be responsible for the strange data on Boyajian's star. 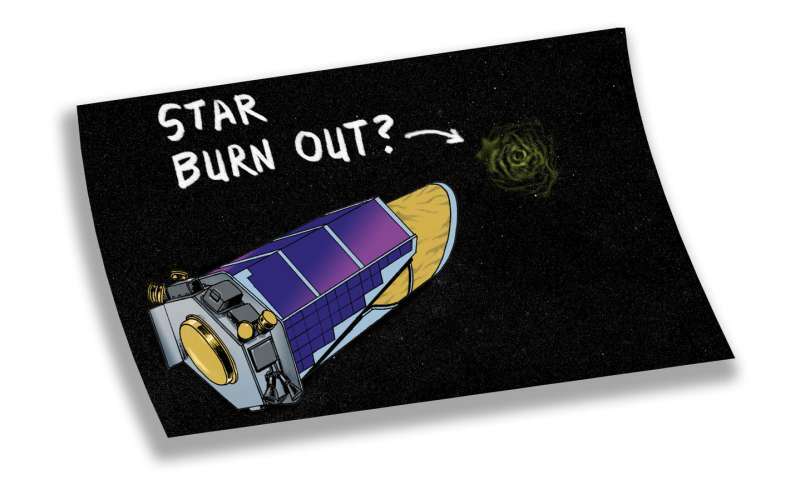 No, says Doug Caldwell, SETI Institute researcher and instrument scientist for the Kepler mission at Ames—for two reasons. First, the results are the same, regardless of which of the telescope's detectors were observing the star, ruling out a defect on the lens of the photometer, or the on-board camera. Second, the enormous drops in brightness were already visible in every single pixel attributed to this star in the Kepler images. Usually, all those pixels need to be added together and the total brightness of a star measured, in order to detect a change; if any pixels belonging to another star are mistakenly included, this can create a false positive. That was clearly not the case here. So far, no warrant has yet been issued for any one explanation's arrest, and so the hunt goes on. With the case of Boyajian's star still open, scientists continue to ask What if…?, and adjust their ideas according to what the data reveals. Some proposed solutions could even come back into fashion as more measurements are made, revealing more definitively whether the star has any companions and how they might interact. Using telescopes around the world to analyze the star's light at all wavelengths and with greater resolution, astronomers are picking out more details of its characteristics. They're also monitoring the star over the long term. "To learn more, we needed to catch it in action again. It just comes down to that," Boyajian said. "We can't rule anything out completely until the evidence warrants it." In May 2017, and again in June, August and September, the star obliged with new performances of unexplained dimming, and astronomers were ready for it. The dips in brightness were smaller this time, and the four events lasted between five days and two weeks. Scientists are now processing this new data, wondering if it will hold the key to understanding this remarkable star. "This kind of patiently executed, coordinated monitoring at multiple wavelengths will unlock this mystery eventually," Batalha said. Until that time, the public and scientists alike can follow the investigation's progress online with the hashtag #TabbysStar, checking for new clues or new dimming events from the star, and watching as researcher-detectives work hard to crack the case. Anything orbiting it would repeat the same dimming at regular intervals and the intervals are not regular. Anything not orbiting it would fall into the star. An obvious first guess; however, with that idea comes the distribution. What could pulverized itself into little dust particles with that distribution? 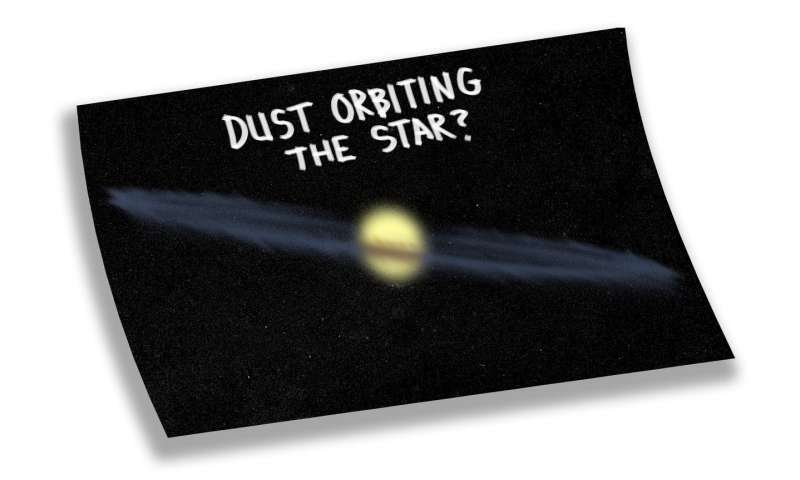 Best guess would be the beginnings of the formation of a planet from dust particles. So the ring would have to be inhomogeneous. Or a huge planet with a huge ring at an appropriate distance. How about more than one ringed planet. Shared Rings? Or simply an inhomogeneous distribution that follow the physics. Regular updates about Boyajian's Star. Wrong! Mass is not an object and space-time is fantasy. All that exists is charge from its center to infinity, the static fields are gravity, the sinusoidal light, the non-sinusoidal are labeled as events. Nothing else. If lambda nu = c for the observed what, pray tell, is lambda emitted? The speed is emitted wavelength over measured period. I like the huge planet with rings at a distance; I considered a big dust ring with a separate body orbiting at a different speed, which would mean a 3 body encounter to explain all three --the star, the dust ring, and a separate body.